....all into one special package deal for only $40.99 (Savings of $7.99) plus $9.00 Shipping and Handling or you can get the Church Office Package #1 Instant Download (No CDs) for just $40.99! Shepherdbase provides churches with a simple and easy solution to track church membership information with unlimited memberships, contribution records, attendance and much more! Small to medium-sized churches often have volunteers who maintains the church records. These volunteers need a database that is simple, inexpensive and user friendly. Bonuses: You will receive two Offering Envelope Templates (#1), Church Auto-Monthly Calendars (MS Word 2010, 2013 or 2016 Version) that you can change to any month of any year with the click of a button, and the Offering Count Sheet as a Thank You for your purchase. Church Forms CD is an awesome collection of every free church form, certificate, flyer...(900+ forms each in PDF and MS Office Word/Excel 2007 or higher version format (Total 1,800+) ready to download, modify and print) on this website (FreeChurchForms.com) all on one CD. Bonuses: Also included for free are the Offering Envelope Templates (#2), Expense Report (Excel calculating format), Attendance Record Form (Excel format that calculates church attendance) Automatically Updated Yearly Photo Calendar, and eBook - "Top Ten Tips to Organize Office" as a Bonus and Thank you for your purchase. You Need: WinZip Program Due to the enormous size of the combination of all these forms, certificates, etc. they are zipped to fit on one CD. You can get a free 30 day trial of the WinZip Standard program and just simply decline all the offers when setting it up. Click Here to Access the Free Trial WinZip Standard Program. Click here to download and print a Church Office Package #1 document that shows what's in the package along with contact information to give to your pastor or church. ....into one special package deal for only $57.99 (Savings of $15.98) plus $9.00 Shipping and Handling! or if you prefer you can get the Church Office Package #2 Instant Download (No CDs) for just $57.99! Pastoral Recordbase provides pastors and/or churches with a simple and easy solution to track church events such as baptisms, baby dedications, funerals, weddings, etc. and track pastor's or minister's sermons with unlimited records/events, and much more! For more information on the Pastoral Recordbase click the link above. Small to medium-sized churches often have volunteers who maintains the church events and/or sermons. These volunteers need a database that is simple, inexpensive and user friendly. Bonuses: You will receive Church Event Certificate Templates (4) (Baby Dedication, Baptism and Wedding Certificates in MS Word format) and the Event Planning Tracker in MS Excel as a Thank You for your purchase! Special Bonus for Purchasing either one of the Church Office Packages! 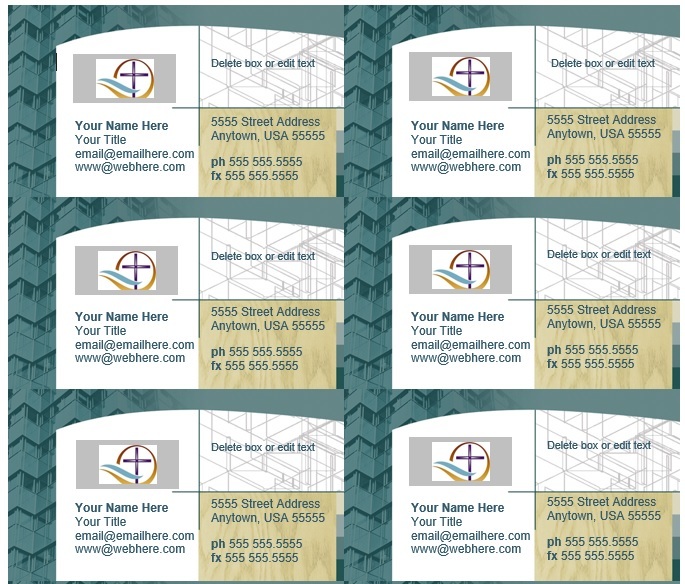 I will email you these Beautiful Business Card Templates (4) when I contact you ASAP with shipping details shortly after purchase! The template pictured to the right is 1 of the 4 templates. Click here to download and print a Church Office Package #2 document that shows what's in the package along with contact information to give to your pastor or church. You can purchase this Church Office Package (Shepherdbase CD & Church Forms CD) for only $40.99 (Savings of $7.99!) plus $9.00 (Shipping & Handling anywhere in the United States within 3-5 Business Days)! Taxes are Only included for the State of Oklahoma Residents. Just click the "Buy Now" button below to purchase this package with any major credit card or PayPal. The PayPal Secure Checkout allows you to pay with any major credit card without a PayPal account you just simply click on the "Pay with a debit or credit card" towards the bottom of your screen during the secure PayPal Guest Checkout process. 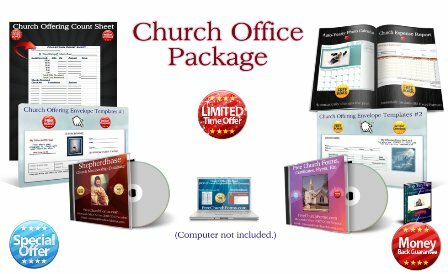 You can purchase this Church Office Package #1 Instant Download (Shepherdbase & Church Forms - No CDs) for only $40.99 (Savings of $7.99!) anywhere in the United States or outside the United States! Taxes are Only included for the State of Oklahoma Residents. Just click the "Buy Now" button below to purchase this package with any major credit card or PayPal. You can purchase the Church Office Package #2 (Shepherdbase CD, Church Forms CD and Pastoral Recordbase CD) for only $57.99 (Savings of $15.98!) plus $9.00 (Shipping & Handling anywhere in the United States within 3-5 Business Days)! Taxes are Only included for the State of Oklahoma Residents. Just click the "Buy Now" button below to purchase this package with any major credit card or PayPal. 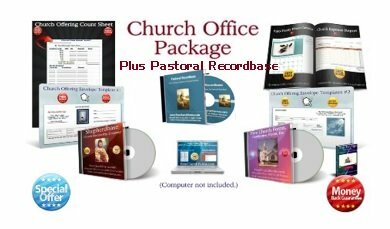 You can purchase this Church Office Package #2 Instant Download - No CDs (Shepherdbase, Church Forms and Pastoral Recordbase) for only $57.99 (Savings of $15.98!) Taxes are Only included for the State of Oklahoma Residents. Just click the "Buy Now" button below to purchase this package with any major credit card or PayPal. You can purchase with PayPal or credit card. If you do not have a credit card or want to set up a PayPal account , you can send a check or money order...just contact me for my mailing address. Your purchase is 100% safe and secure - and 100% risk-free with the PayPal Secure Checkout process. Return to Home Page from Church Office Package.